September | 2014 | Where's Merrill? “The oldest and first family that became inhabitants in the parish of Kilmacteigue was the name of Anders. There were 7 brothers of them and it appears they were the first that ever employed a horse beast as an assistant in reclaiming a portion of ground. However, in them days people were quite simple. This Anders found it necessary in providing a pair of creels for equipping the horse, and when tackling the horse first they brought the horse inside of their house, and when they fitted the creels each side of the horse they could not conceive how the horse would get out of the door. I came across this wonderful publication on the Ancestry website. 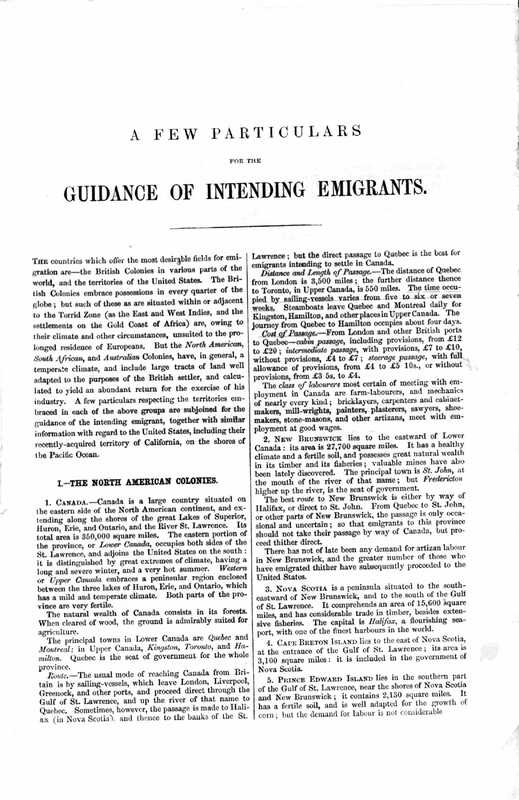 The official title was “Emigration Atlas 1852” by W Hughes Esq, and it was published in London for the benefit of British and Irish citizens who were considering emigrating to the faraway civilized lands of the world as established at that time, over 160 years ago. Many present-day nations were yet to be founded with the geographical boundaries we recognize in the 21st century.. The complete atlas book only stretches to a dozen or so pages, but it contains a veritable mine of emigration info of great value to readers of the day, and of course, readers of today from a historical perspective. It includes detailed maps of Canada, the United States, Mexico, South America, the Cape Colony and Fort Natal, Australia, Tasmania, and New Zealand. These were the British emigration hot-spots in the 1850’s. The maps show the primary overland travel routes to far-flung cities and new towns offering employment opportunities. The original maps were printed in color with settlements where British subjects would be made welcome shown in red outlines. Most interesting of all (for me), the atlas contains write-ups for each destination, giving a concise description of the country, the cost of passage, the journey in miles and time, the types of workers needed at each destination, potential wages to be expected, the local cost of living, and other invaluable particulars for the would-be intrepid voyagers. 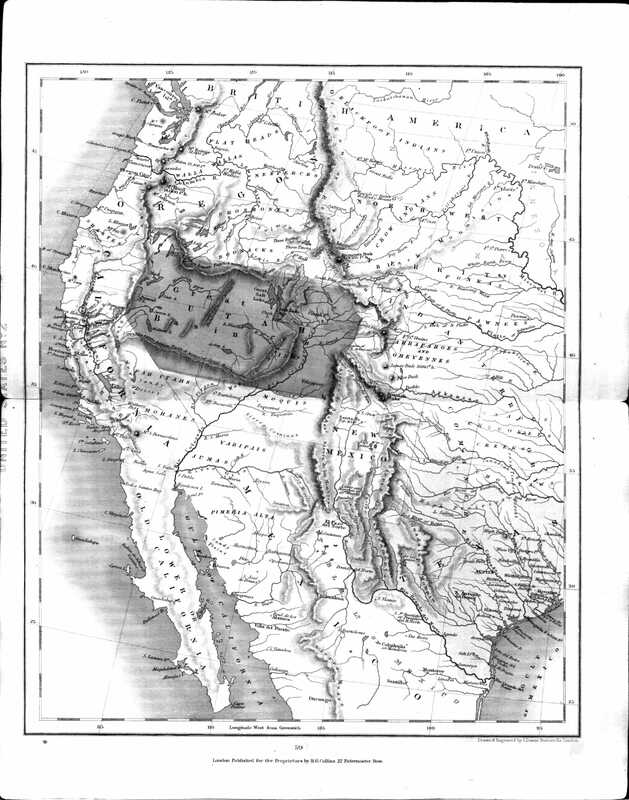 By sea to New York and then overland westwards “through a country destitute of roads, and presenting almost insurmountable difficulties to the traveller.” Plucky pioneers were advised that the Trans-American leg alone would take 3 months. 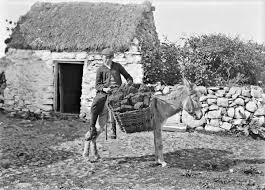 Despite the warnings, most of the early Irish settlers in California took Route One; it was the cheapest and the only affordable means of getting to the gold mines. By sea voyage to the port of Chagres on the Panamanian Isthmus, either directly or via New York Harbor. Then 50 miles overland to the Pacific Coast of Panama, taking 3 whole days! Finally, another 3,500 miles sea voyage northwards to San Francisco – before buying a mule and heading off into them thar hills, possibly to become rich or to never be heard of again. By a direct sea voyage around Cape Horn, disembarking at San Francisco. This excursion was favored by the wealthier, upper-class passengers. In 1852, it took a mere 5 months to complete the 17,000 miles across several fearsome oceans. The author, Mr Hughes, does point out that plans are well underway to make Route Two more popular by the construction of a railway and canal across the 50 miles of impenetrable Panama forests and mountains. When the canal is completed, seafaring ships can trim 9,000 miles off the Cape Horn route. Mr Hughes was as optimistic as the 19th Century canal engineers. We now know that it took three attempts and sixty more long years to get the Panama Canal finished. This world-famous waterway celebrated it centenary last month in August 2014. The passing of a close family member in old age always results in sadness, and then happy reminiscences going all the way back to our childhoods. Old family photos are dusted down and shared, and we suddenly realize how special and unique those snapshots of a bygone era really are. There is only one photo of the complete Neary clan (circa 1950) as a proud family unit. 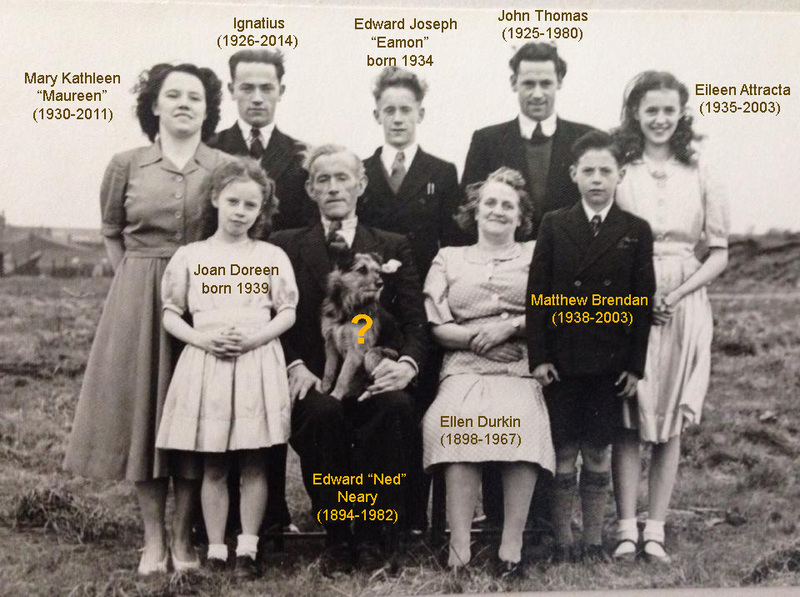 This outstanding image, reproduced below, shows my grandparents, Ned Neary and Ellen Durkin, and all seven of their children – plus the family dog, of course. My father, John Thomas, was the eldest child, and also tragically the first Neary sibling to pass away in 1980. The photo was taken about a dozen years after the Neary family relocated from Tullinaglug in County Sligo, Ireland, to Withnell in Lancashire, NW England. Ned was a hard-working labourer whose weather-beaten face always made him look much older than he actually was. By 1950, all the Neary children were smartly-dressed. Ned & Ellen did a fine job after escaping the comparative poverty of the west of Ireland in the 1930’s.